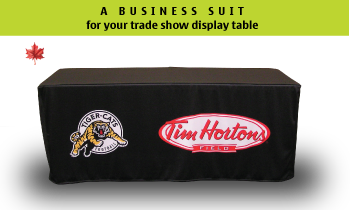 Our TableCovers.ca brand offers a wide range of durable and effective table covers, tablecloths, table drapes, table skirts, and table runners that create a high quality professional appearance for conferences, exhibits, retail, special events, table top shows and trade show display tables. 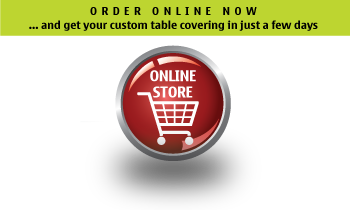 These custom branded logo table cloth products turn any table into a professional, attention-getting promotional & advertising branding space . Plus, they're incredibly light weight and easy to transport and store. Check out our main web site / online store at www.signsplus.ca for a better online experience and full product selection. 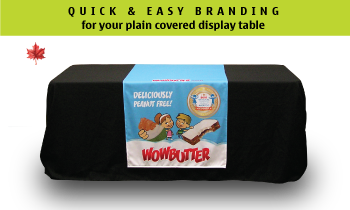 High quality table skirts custom made in Canada with dye sublimation printed logo / full colour graphics. Flame retardant, wrinkle resistant 100% polyester knit fabric - wrap around the table edges. Any sizes & unlimited print options, ships in 5 business days. Optional kit with table top throw cover and plastic edge clips. 6' kit as shown $399. 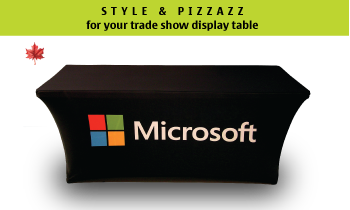 Folding display tables, carrying bags and accessories for your portable table display. In stock and ready to ship. 6 foot rectangular split folding table shown $99. 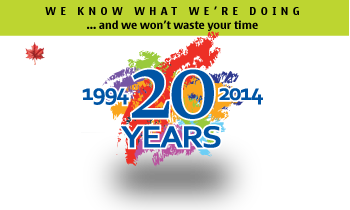 We've been in business since 1994. We won't waste your time ... or miss your deadline! Copyright © 1994 - 2017 Signs Plus Inc.